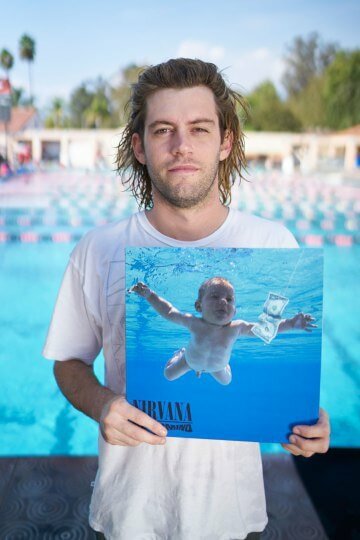 Spencer Elden was just a few months old when he was photographed by an acquaintance of his dad’s as part of a photoshoot for an up-and-coming band called Nirvana. Elden’s parents were reportedly paid only $200, and the shoot lasted around 15 seconds. The album, Nevermind, was a big hit, and the image went down in music history as one of the most recognisable album covers of all time. Now, 25 years after the album was first released, Elden has taken to the water to recreate the iconic photograph. “The anniversary means something to me. It’s strange that I did this for five minutes when I was four months old and it became this really iconic image,” Elden, now an artist living in LA, said. In the past Elden has said it felt strange for the photo to be so famous. “Looking back, it feels kind of stupid doing interviews about it, because I had nothing to do with it but a lot to do with it all at the same time,” Elden told Time magazine. He recently investigated whether he could take legal action against Geffen Records for the use of his naked image, but was unsuccessful. “It’s hard not to get upset when you hear how much money was involved,” he told Time.